Terrines are great if you plan something special for your guests but don’t want to spend the whole evening in the kitchen. They can be prepared one or two days before and when the guests arrive, the only thing you need to do is to cut off some slices and finish the other components of your dish. Another great advantage is that they are very versatile. So if there are some leftovers from last nights dinner, you can still use them in combination with other ingredients. Usually terrines are used only as main elements in cold appetizers. This recipe is a nice example for using terrines as accompaniments in warm dishes served as a main course. This entry was posted in Main Course, Pork and tagged apricot, bell pepper, bistro, fillet, grill, grilled scallions, grilled spring onion, jus, lentils, pork, pork fillet, pork jus, recipe, scallions, spring onion, terrine on August 27, 2011 by Robert. Apricots belong to a special group of fruits. While most fruits loose more or less flavor when cooked, for apricots actually some gentle heat really enhances and helps to develop their flavor. Therefore it is always wise to bake or cook apricots before any further use. Or – if there is no time – just simply toss with some brandy or schnaps and flambe. For baked apricots you can either leave the skin on (and remove easily after baking) to get a more vibrant sour and tart note. Otherwise briefly blanch the apricots in hot water and peel them. For this current recipe I removed the skin because I didn’t want to have too much tartness in the end result. 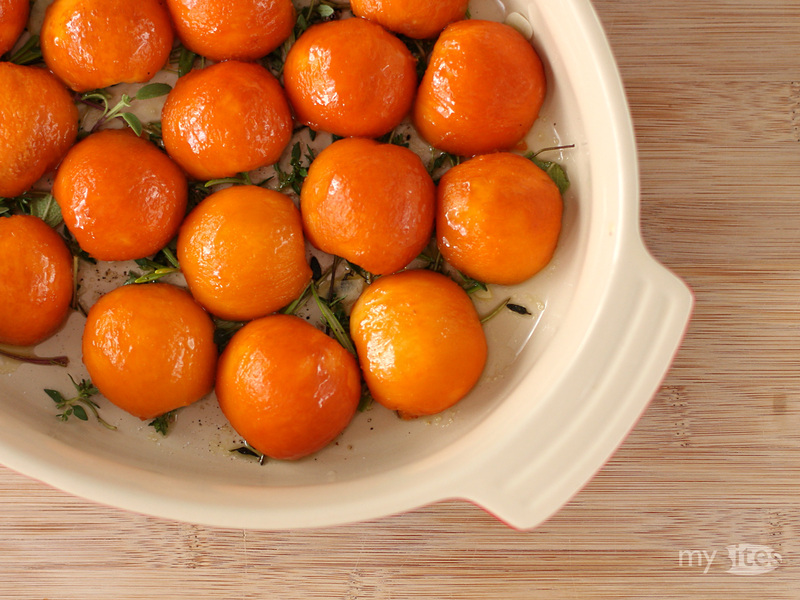 I baked the apricots at low temperature on a herb bed which enriched its flavor and took it in a savory direction. The original idea for the herb baked apricots itself is based on a recipe from German 3-star chef Juan Amador‘s cookbook. I’ve already prepared it several times and always tweak on the combination of herbs and the preparation. E.g. removing the skin before baking is clearly a better choice. 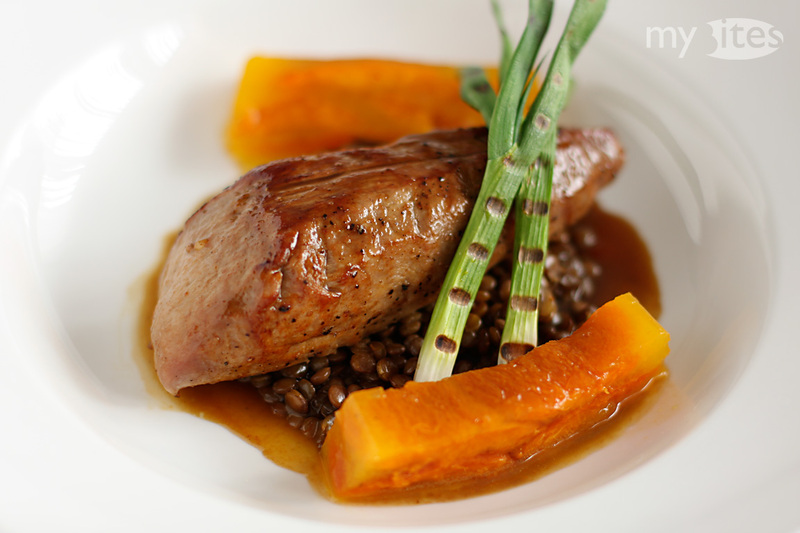 The apricots pair really well with liver or mushrooms. In this recipe I incorporated them in a terrine, which can be used in multiple ways. This entry was posted in Appetizer, Vegetarian and tagged appetizer, apricot, bell pepper, cep, dill, garlic, herbs, mushroom, mushroom boletus, recipe, rosemary, sage, starter, terrine, thyme, vinaigrette on August 23, 2011 by Robert.